In late 1965 through 1966, Shelby American participated in a great public relations idea. 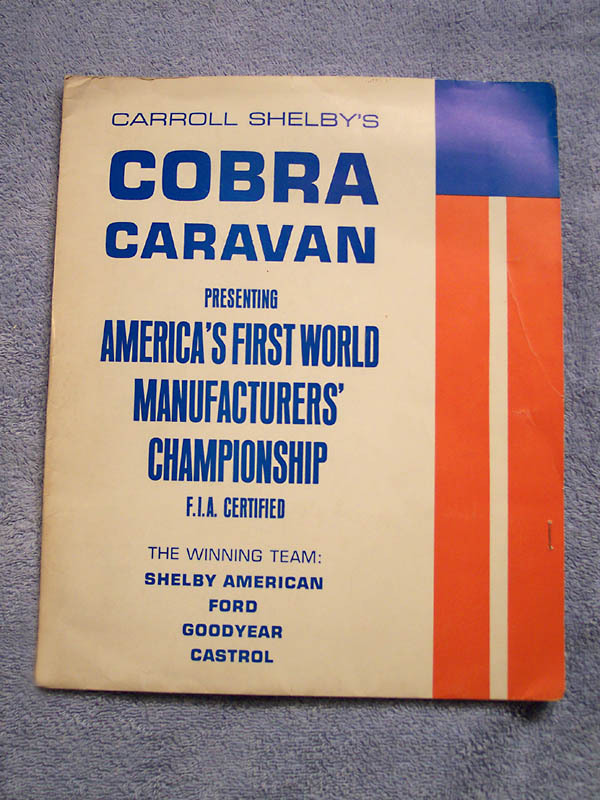 They painted "Cobra Caravan" on the outside of one of their car carriers as well as a list of the race tracks the team visited in 1965 on the carrier's rear doors. They filled the semi with a 1965 GT350 R-model, a Daytona Coupe Cobra, a GT40, and a 427 Cobra competition model. They toured throughout the United States stopping off at Ford dealers who were also Shelby American dealers. Booklets like the one shown here, which describe each type of car displayed, were handed out at each stop. Reproductions of this booklet have "Reproduction" written on the inside of the lower flap inside the booklet.